Today we’re going to look at one kind of IELTS writing task 2 question that often makes students a little worried: the two-part question. This is also sometimes referred to as “the direct question” as it is more direct than other types of writing question, such as advantage/disadvantage or problem/solution. I will show you what this question looks like and how to answer it. What is a Two-Part Question? In IELTS writing task 2, there are different sorts of questions you may be asked. One of them is called the two-part question (or sometimes “the direct question”). It is most commonly called a two-part question because it contains two distinct questions. Of course, some other questions also contain two parts. For example, a problem and solution essay is two parts. However, what we mean by a “two-part question” is one that contains two questions. The reason this is sometimes called a “direct question” task is that the questions themselves are more direct than other IELTS writing task 2 question types, which instruct candidates to explore an idea. This is rather vague, whereas the two-part question is very specific. In education and employment, some people work harder than others. Why do some people work harder? Is it always a good thing to work hard? Ok, the first thing that you may notice is that there are three parts to this question! However, the first part is actually a lead-in statement. It is not particularly important. The parts that you need to address in your essay are the two questions. This is why some people say “two-part question” and others say “direct question”. Happiness if often considered difficult to define. Why is this? What factors determine happiness? Success is often measured by wealth and material possessions. Do you think wealth is the best measure of success? What makes a successful person? As you can see by now, each question has three parts: an introductory statement and two individual (but related) questions. You will see this exact format used with numerous IELTS topics. Sometimes the lead-in statement will be very long, and sometimes the questions quite closely linked. Other times the statement may be short or the questions asking quite different things. The first thing to remember is: DON’T PANIC! Two-part questions often make students a bit nervous, but really they are not so bad. They are no more difficult to answer than the other IELTS task 2 question types. In fact, this type of question may even be the easiest one to answer! Although the questions themselves are sometimes a bit challenging, they are direct questions. This means that it is less likely you will stray off-topic while writing. In other words, your task is actually more straightforward than it would be with an agree/disagree question, for example. Let’s look at an example question so we can analyse it. This is the first thing you should do in any IELTS writing task 2 essay, and it’s important to spend a minute or two thinking carefully about it. Some parents buy their children whatever they ask for, and allow their children to do whatever they want. Is this a good way to raise children? What consequences could this style of parenting have for children as they get older? We can take three steps to analyse this question. Let’s look at the first sentence: What is it about? It is about permissive parents – ie parents who give their children too much (or who give in to their child’s demands) and let them do too many things. Next, the first question contains a pronoun (“this”) which refers to the ideas in the first sentence, and asks if it’s good or not. The second question talks about the consequences – not for the parents, but for the children. I have deliberately chosen a slightly difficult question here in order to show you how to answer it. Usually the questions are a little more direct and obvious, but here you need to consider the three sentences in order, understanding each fully. In a situation like this, if you make an incorrect assumption about the first or second parts of the sentence, it may cause a serious lack of coherence and cohesion, in addition to poor task achievement. For example, if you thought it was just about children not being made to study enough, you might write the next paragraph all about a lack of studying and the following one may come back closer to the correct idea because of the more specific question. This would look bad, indicating a lack of unity in your writing. Thankfully, it is not difficult to create a perfect two-part essay structure. In fact, it is very easy! Now, in a previous article I talked about whether to use a 4 or 5 paragraph essay. This is one case when you definitely want to use a four-paragraph essay. By the way, please do consider subscribing to my YouTube channel for weekly updates. Also, give the video a LIKE as it helps me to give better and better IELTS advice. In this section, I will give you my sample answer to the above question, using the basic four paragraph structure that I mentioned. Obviously, my ideas will be different to yours, but the structure which I outlined can be used 100% of the time. In today’s society, some parents are becoming increasingly permissive. They do not impose sufficient discipline on their children, and in some cases buy them too many things. This essay will explore why this is not a good way to raise children and why it will have negative impacts upon them in future. While it is understandable that parents want to give their children expensive toys and let them run freely in the streets, this is actually not really an appropriate method of parenting. Having too many toys encourages children to be materialistic and does not offer them the same change to develop social skills like sharing. Furthermore, when children have asked for the toys, it gives them a sense of entitlement and even power over their parents. As for giving children too much freedom, there are obviously a great many dangers in this world from which they need to be kept safe. Children also need rules and boundaries to encourage them to develop into mature and responsible adults. If parents insist on this permissive style of parenting, their children will grow up with very different values from those of stricter parents. Children who were never forced to study will end up with poorer grades in school, and those who were given everything they wanted as children will expect everything to come easily as adults. In short, they will lead difficult and disappointing lives, in contrast with what their parents hoped. In conclusion, although it is tempting to give children whatever they want, parents ought to set rules and boundaries, and to be careful with how they reward children. If parents fail to impose a basic level of discipline, children may grow up with a poor attitude that will cause them and others to suffer. There are really no words or phrases that are unique to the two-part question essay. Just use regular academic English as with any other IELTS task 2 question, and of course stick to the topic. For my essay, I used the word “permissive.” It means allowing too much and not setting enough rules. You could use similar words like “liberal,” “easygoing”, “live and let live”, and so on, although they vary slightly in precise meaning. As always, remember to avoid IELTS phrases and other cliches. Learn new vocabulary by topic and in collocations rather than isolation. Practice this question type often before the exam – it’s pretty common! Make sure you understand each part of the question before answering. Always use the four-paragraph essay structure. Work on idea-generation at home in order to come up with good, on-topic answers. I made this article into a short video. Please give it a ‘LIKE’ and subscribe to the channel. PreviousIELTS Writing: Should I Write 4 or 5 Paragraphs? David S. Wills is the author of Scientologist! William S. Burroughs and the 'Weird Cult' and the founder/editor of Beatdom literary journal. He lives and works in rural China, and loves to travel. He has worked as an IELTS tutor since 2010, has completed both TEFL and CELTA courses, and has a certificate from Cambridge for Teaching Writing. 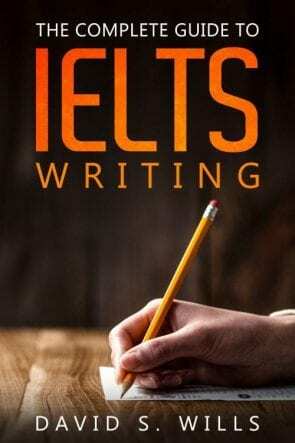 In 2018, he wrote the popular IELTS handbook, Grammar for IELTS Writing. His other IELTS website is called IELTS Teaching. Do I Need to Use Idioms for IELTS? TED-IELTS is in no way affiliated with the TED non-profit organization.